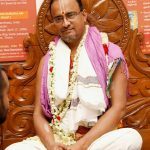 On Guru Poornima, July 27 2018, Sri Swamiji celebrated the special occasion at the holy kshetras of Senganoor and Govindapuram, near Kumbakonam in Tamil Nadu. In the morning at Senganoor, a procession, tirumanjanam and worship was performed for the Guru Padukas of Paranur Mahatma Sri Sri Krishna Premi Maharaj. That night was a rare total lunar eclipse, an extremely auspicious time to perform Nama sankirtan. So on Guru Poornima night, at Govindapuram (the hallowed ‘Nama’ kshetra that is home to the jiva samadhi of the great saint Sri Bhagavan Nama Bodhendra Saraswati Swami), at Chaitanya Kuteeram (the abode of Lord Jagannatha and Sri Chaitanya Mahaprabhu himself), under the shining full moon, blissful Mahamantra kirtan was performed. The devotees then continued Nama kirtan through the night until the eclipse was over. “A mother delivers a child, and then delivers a second one. Here she does not know the place from where the child has come. Likewise all the different living species such as birds, animals, small insects, and animals under water, etc. are born every second on this earth. The earth exists just for this purpose – of all to be born here and to attain the Lord. Unless we take a human birth, liberation is impossible. Everyone acquires sins (paapa) and merits (punya) during their lifetime and this decides their next birth. If the individu al committed only sins, he would be born as a living being with just one sense; if he has committed more sins and a little bit of merit, he would be born as an organism with two senses; and so on. But every jiva has to take a human birth to realize Bhagavan and attain liberation, which is a rare one, as it is up in the ladder, with six senses. A lot of jivas take a human birth, but they may live in some other regions and their life also may end without them even hearing about the Supreme Lord or even the term liberation. But the soul is reborn again and again. In one such rare life he happens to take birth as a human in a family where the parents take the child to the temple in the morning and do basic pooja of the Lord at home. Then he continues to take many births again, continuing to be an astika (believer of God) and performing various holy activities like going to different temples, worshipping different deities, taking holy dips in holy rivers, visiting astrologers, doing Navagraha poojas, etc. He thinks he is happy the way he is, but he doesn’t know about liberation. After numerous such births, he acquires major punya (merit) and gets a human birth where he goes to a Guru and then meets another Guru and so on, as he hasn’t yet found peace. Like a paper that flies in the direction of the wind from place to place and finally has the fortune to land on a temple tower. Similarly, he moves from one Guru to another until he finds a real Uttama Guru. But Mahans don’t agree that one gets to a Uttama Guru as a result of his/her punya – merits acquired. They say that one attains a true Guru only because of one’s Bhagyam (good fortune)! Once he gets a Guru, he listens to His Guru’s katha over and over. He visits him often as he is very loving. Like a wet cloth put out for drying in the sun, dries automatically, he gets transformed just by being in the presence of the Guru. The Guru does not have to talk to him or does not even have to give any discourse. There is a constant divine wave that keeps coming from the Guru, that transforms everyone who is present there. How does the transformation happen? For some, they might have been a sadhak (a spiritual aspirant) in their past births, and they may just need a pat from the Guru to restart from where they left. For others, it could be a real internal struggle – to get over the ego. Ego is required for anyone to not be in inertia, and to do activity. He makes mistakes, learns from them, and slowly in the process understands his own faults and tries to correct himself. But he fails in the process; and getting frustrated, finally like a terminally ill patient he gives up. He also realizes that no amount of japa or dhyana is going to help him get rid of his ignorance and finally sincerely surrenders to the Guru. Then by the grace of the Guru, he gets scared of this worldly life, by seeing death, accidents, disease, and old-age. This slowly makes him look for a place where he can be fearless. Then he realizes that it is only at the Guru’s holy feet that he can be fearless. This transforms him slowly. He starts to see the world differently than before. He chants 10 Rama Namas. Then when he is in a train during a journey, he sees a sweet seller on the train repeating the name of the sweet over and over to sell and make a living. This makes him think and chant more… like this when the Guru tattva (philosophy) enters one’s being, he will start seeing things around him differently. Slowly he will start chanting Nama involuntarily. This continuous chanting leads one to the state of Prema Bhakti purely by the grace of the Guru. The reason for all this is: some edruchhaya (by chance), some punya vishesham (acquiring merits), the Lord’s grace, and bhagyam (fortune)! 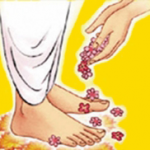 When a jiva attains the feet of an Uttama Guru, a new life starts for him. The prime purpose of the Guru is to take you to moksha (liberation) and bestow jnana (divine knowledge). 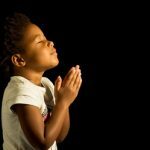 To pray for a job, a child, marriage, etc. one can go to a temple and a deity and have their prayers fulfilled. Similarly, to fulfill other worldly desires there are many homams, etc. But again, no one says one will get jnana by performing homams. The Lord will not send one to a Guru to fulfill worldly desires. The only fruit, and the most important fruit, of going to a Guru is attaining Jnana. Pooja is more than just performing archana, abhishekam, etc. Pooja is smaranam! Pooja is thinking of the Lord! 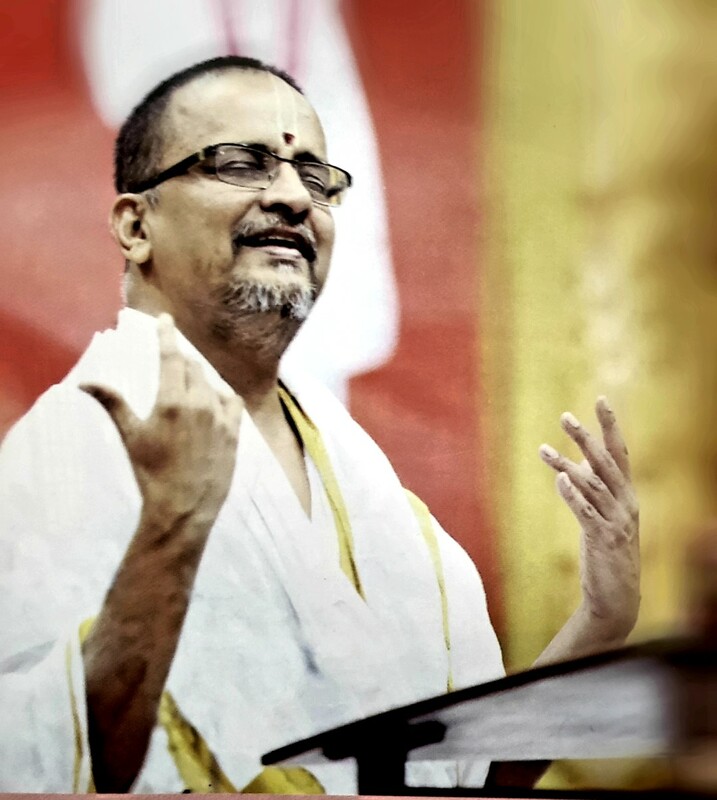 Instead of saying that by doing pooja of archavataram (the worshipped image of the Lord) one gets Bhakti, it would be more accurate to say that the moment one gets Bhakti, he will long to do pooja to archavataram as he sees true divinity! Not bhakti through pooja, but pooja because of Bhakti! 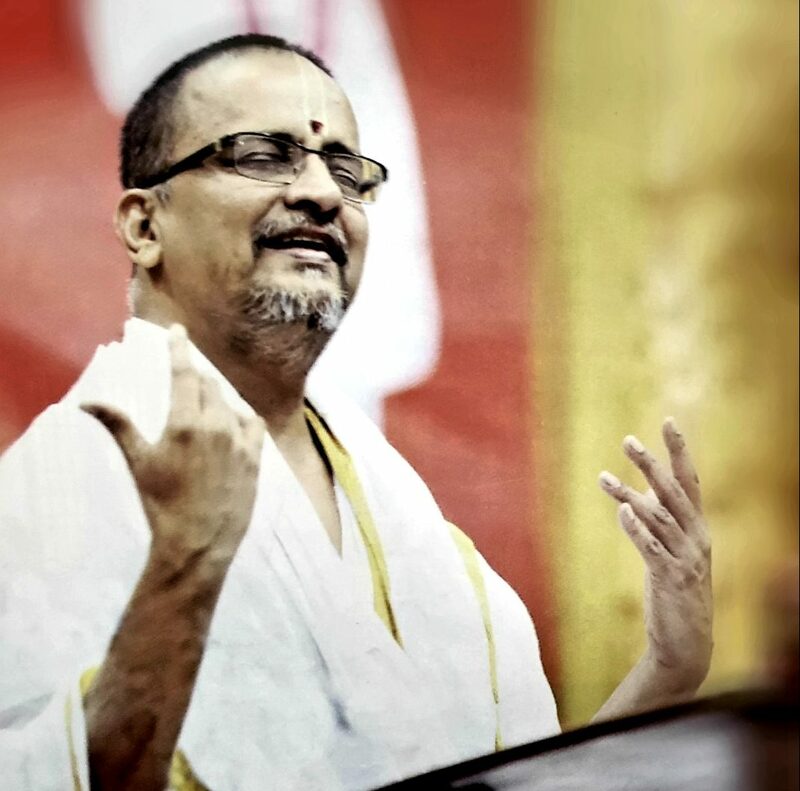 True worship is manasika pooja… worshiping in the heart. What we can do in our hearts, let us do outside so that everyone can enjoy it – it is for this reason we have festivals for deities, pooja, etc. What can we do for the Guru on this Guru Poornima day? NOTHING! Because He does not have any need at all. With our minds, we can do a namaskaram. That’s all! 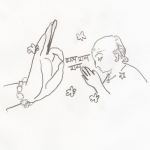 All our karma indriyas (five sense organs), jnana indriyas (five senses) and the mind – let us offer to Guru! And have gratitude to Him in every step. O Hrishikesha (controller of the senses), let me be only an instrument. You are the operator. The Guru in Bhagavata Dharma is different from the other Guru in general, in that, here, rather than counting the blessing in terms of the wealth that we have or the number of children that we are blessed with, we would think how much Bhagavatam has been heard; how much Nama we have said; how many temples we have been to; how many darshans we have had; how many times we have thought of God. That’s how we estimate the progress in the satsang! The laabham (fruit) here is different (not a worldly benefit). Sometimes, when we have something very valuable, we fail to realize its greatness. This satsang is such an invaluable one. All of us are truly blessed! Let us understand that there is a thing called Moksha (Liberation). This is a part of HH Maharanyam Sri Sri Muralidhara Swamiji’s discourse on Guru Poornima day 2018. Excerpted and translated by Yamini ZivanPrakash, Dallas TX.